May is a fabulous month to see an abundance of wild flowers birds and mammals. 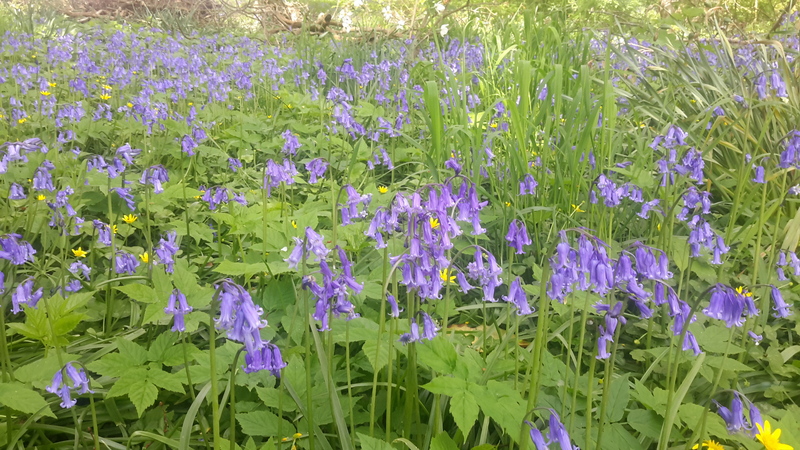 Just in our gardens alone there are beautiful bluebells ,wild garlic , celandine and bugle. 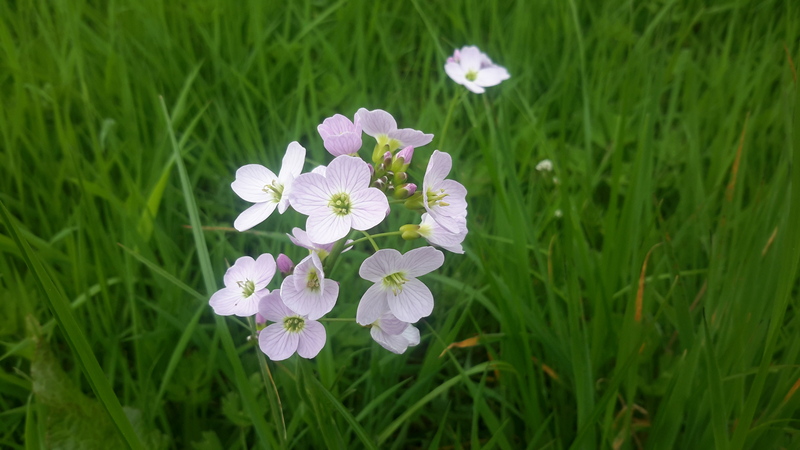 I am always delighted by the sudden profusion of wild flowers that pop up around the grounds at Cavens. Ever since I can remember I have loved wild flowers and birds . I am not an expert at all! I can remember walking with my Grandmother and she would point out and name wildflowers growing in the hedgerows, now I walk down the drive and around the garden and try to spot and name as many as possible. 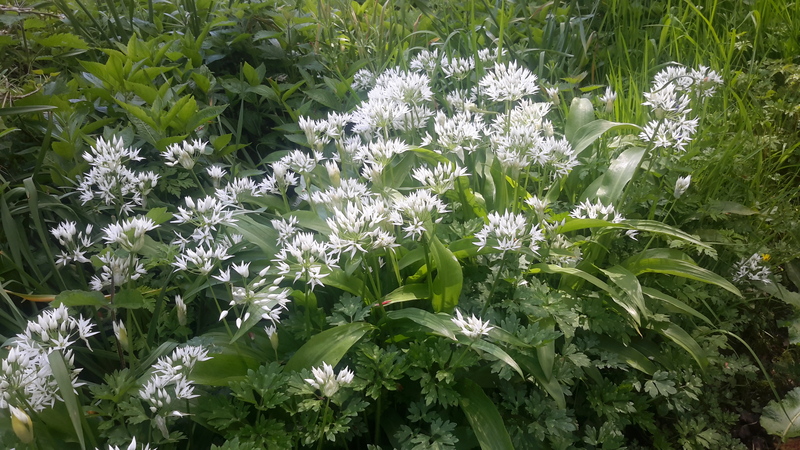 The Wild garlic looks amazing , huge swathes of white blooms. We have been using the leaves in cooking over the last few weeks, Angus has been shredding them along with the spring greens just to give a little extra flavour and depth to the greens.... delicious! 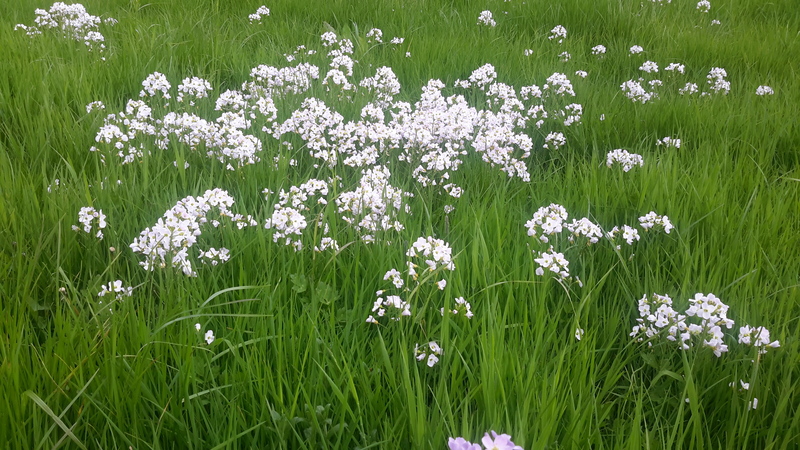 There are vast swathes of Ladies Smock in the field known as Cavens Park, which looks delightful from the garden. 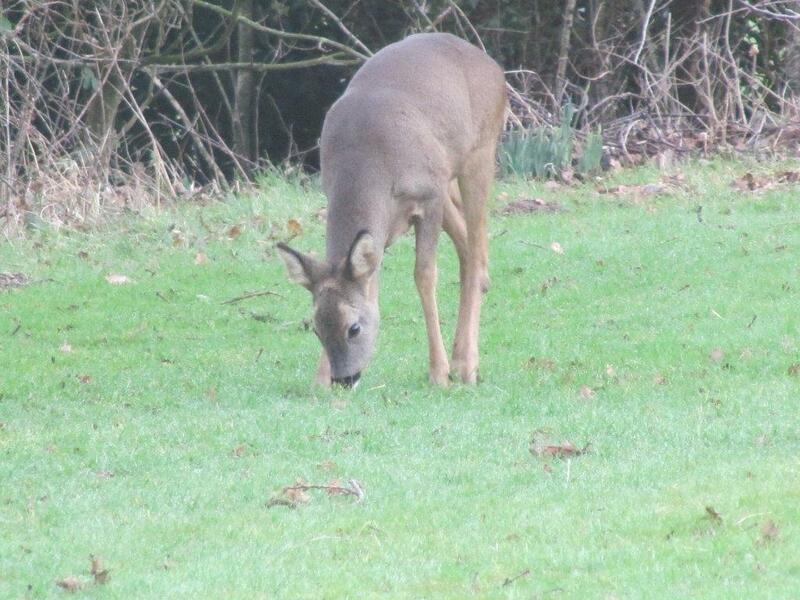 The Roe deer which are in and out of our garden can be seen wandering around the edge of the field at the moment which has long grass. I wonder if the doe is about to have a fawn . She has sucessfully had a fawn for the last couple of years and it would be lovely to see that again. Our guests are much better than me at bird spots. I was very happy last week when a lovely couple were thrilled to spot out of the window at breakfast time ..... Mistle thrush, goldfinch,tree creper and nuthatch amongst others and kokingly thanked me for laying it all on for them including the sweetest red squirrel that just happened to run over the lawn at just the right moment! ......... Perfect! I have seen beautiful collar doves bobbling around and two or three fabulous bullfinches near the vegetable plot . However I think the best bird spot from the last fortnight isis of a Whimbrel down at Carsethorn ........ spotted by two separate guests. 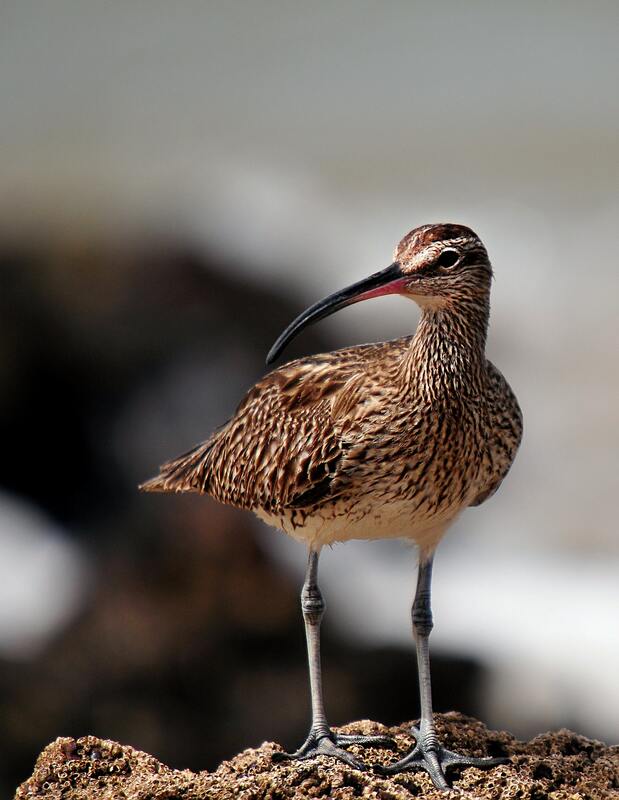 I have never knowingly seen a Whimbrel before ... told you I was no expert! So if you are visiting opop down to Carsethorn only a mile from the hotel and you may catch a glimpse ! There's always a chance to see a red squirrel or two either collecting nuts or scampering across the lawn or digging up last years burried nuts from underneath the yew trees. Its a bit early yet to see fox cubs playing in the field but have include a picture(not a great pic ... sorry) of one of last years cubs just resting in the lower field. Hopefully when you come and stay at Cavens you will be able to see some of the amazing wildlife and nature literally on our doorstep! !